Verosimile used dance and songs to explore themes as group vs individual, conformity vs. identity, and appearing vs being. Thomas Hauert made a splash in 2001 with the solo Do You Believe in Gravity? Do You Trust the Pilot? in which he initiated a new type of investigation combining short texts and songs with his movement vocabulary. In Verosimile he adopts a similar approach in order to explore the numerous possible ways in which dance, theatre and songs can interact, complementing and modifying each other. “Lying, the telling of beautiful untrue things, is the true aim of art,” said Oscar Wilde. 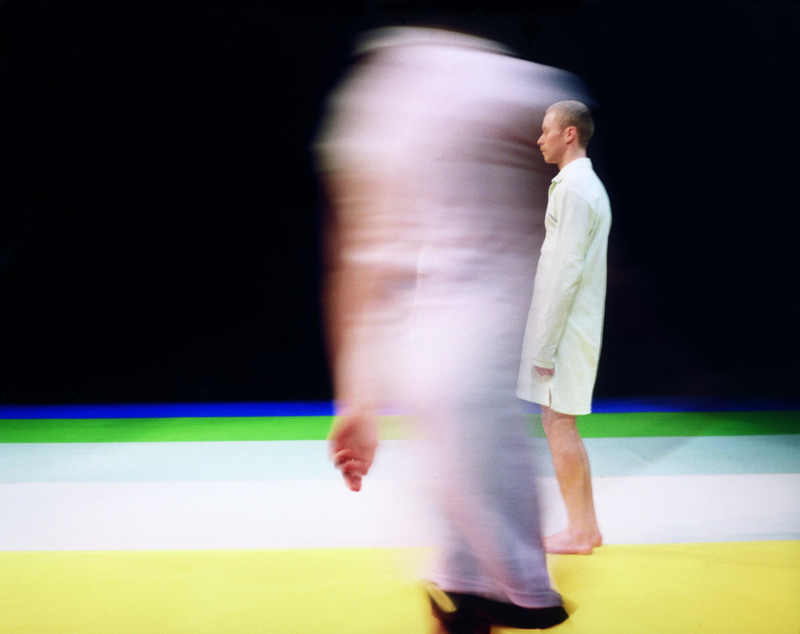 On the subject of transformation, of changing identities, Thomas Hauert and the members of ZOO most definitely invite us to such an experience in Verosimile, constructed between what’s real and what’s false, between the body’s actual appearance and its simulacrum on stage. Thomas Hauert’s company ZOO functions as a collective. The four dancers present on stage with him, his long-time companions, closely collaborated in the creation of Verosimile. They co-wrote the lyrics and music of the songs they perform with the help of a hand-held microphone, and they developed part of the choreographic material based on improvisations. This improvised aspect and the unexpected elements it entails coexist with an extremely strong written structure. The determinate and the indeterminate are superimposed to bring tension and vitality to the dance. The dancers move according to geometric patterns, the compositions unfold in the shape of arches, lines and circles; an accident is never far away. The dance gradually takes hold. The dancers take their time to walk around a stage covered in pastel coloured stripes and lit by circular beams lending it a contradictory aspect as an ornate as well as bare music hall. Verosimile is a humorous and mocking account of people gathered in groups by way of the funny attitudes adopted by their bodies. The audience sees a number of variations on togetherness and separateness. The dancers, at first free and alone, gather to circle slowly and then to walk in step in single file to an almost martial beat (fortunately all warlike implications are undermined by the translucent night-dresses worn as uniforms). The unison ends in a cacophony of limbs knocking together. Other moments offer a fleeting vision of identity, doubling and multiplicity. The shapeless group, gathered in contact improvisation, resembles a Hindu deity with many and ever-changing limbs and faces. One of the dancers assumes consecutively, and only for a few beats, the guise of a Renaissance angel with a straw wig or of a dubious Iggy Pop. The mechanics of man becoming or originating in an animal is explored by strange birds and all of a sudden one remembers but of course! that this company’s name is ZOO. One of Hauert’s first pieces was called Cows in Space. It was already about gravity and airiness and the combination of opposites. That is true singleness of mind mind you keep on watching this choreographer! Do you Believe in Gravity? Do you Trust the Pilot?